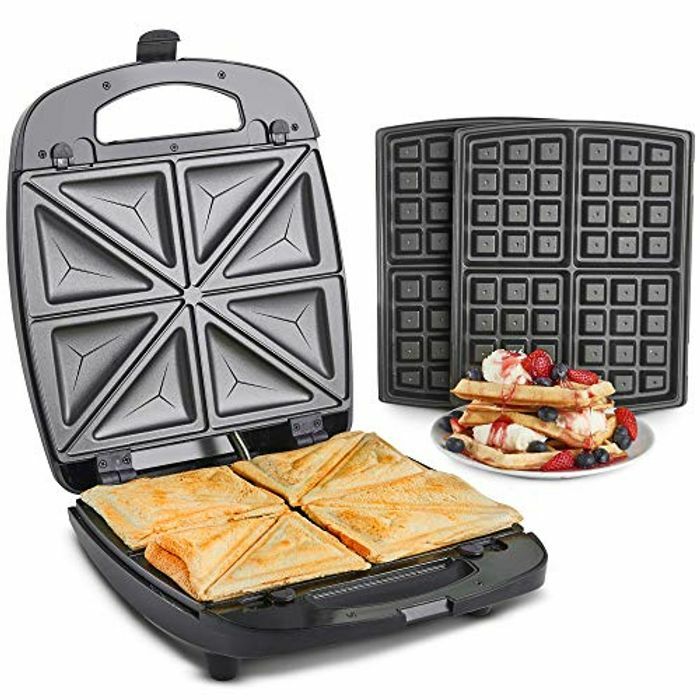 2 IN 1 SNACK MAKER: Make delicious savoury toasties and sweet golden waffles with the VonShef 2-in-1 Waffle Iron and Sandwich Maker. NON-STICK PLATES: The non-stick plates mean your waffles and toasted sandwiches will slide out with no fuss or mess. Cleaning up is also a simple task, just wipe down the plates with a damp cloth. AUTOMATIC TEMPERATURE CONTROL: No more messing around finding the correct cooking temperature, the VonShef 2-in-1 Snack Maker does all the hard work for you. Simply wait for the ready light to go off, indicating the appliance is heated up and ready to use, and insert you mix. LARGE REMOVEABLE PLATES: Make up to four portions at one time thanks to the large four slice plates, perfect when entertaining guests or making batches of yummy treats.